Cabin USA offers several cabin rentals with Internet Access in Smoky Mountains Pigeon Forge, Sevierville and Wears Valley, TN area. Still need to check your email, keep up with friends and family on your social sites or maybe your vacation still requires contact with the office for which Internet access while on vacation is a must, relax our cabin rentals with WiFi Internet Access accommodate your needs for keeping in touch and continuous online socializing. Wifi Internet rental cabins provide families the immediate gratification of being able to share pictures and video of their daily Smoky Mountain adventures with family and friends back home. Eliminates the need to drive thru Pigeon Forge or Sevierville chasing after a WiFi Internet Access connection just to get up to the minute weather reports or those last minute online discount coupons to Pigeon Forge Attractions. Smoky Mountain cabin rentals with WiFi Internet access allow you to check updated Smoky Mountain Area Events, road condition reports, local fishing reports or search for local restaurants when planning meals away from your rental cabin in the Tennessee Smoky Mountains. Play and work from a more relaxed atmosphere. Our Smoky Mountain cabins with WiFi access allow you the freedom to wander about your cabin, to enjoy the outdoors from your Smoky Mountains cabin porch or family members as they play nearby in the cabin's hot tub. In order to use our Pigeon Forge and Smoky Mountain cabin rentals WiFi Internet access, your laptop or Internet mobile devices must support wireless connectivity. Our rental cabins support from the oldest to the newest wireless technologies. Browse our extensive inventory of affordable cabin and chalet rentals, book your Smoky Mountain Pigeon Forge WiFi Internet cabin online and receive immediate SAVINGS! Escape to this Pigeon Forge cabin for rent at “Alone At Last!” This 1-bedroom cabin rental features a 3D television, fireplace, and more. Escape to your Pigeon Forge honeymoon cabin with outdoor fireplace, hot tub, jacuzzi, relaxing views and more. Get your immediate Online Cabin Discount when you reserve online! Welcome to "Our Happy Place," a 1-bedroom cabin in Pigeon Forge that's near Teaster Ln and Dollywood Theme Park. Book today for your luxury honeymoon cabin! "Out On A Limb" is a unique treehouse-styled cabin with luxury amenities, resort pool access, and a 15% discount in beautiful Pigeon Forge, Tennessee! Enjoy this honeymoon cabin with pool access near Pigeon Forge and Dollywood! 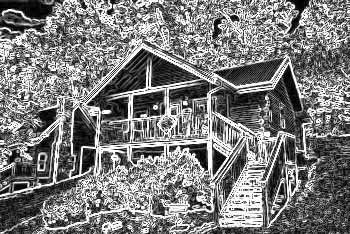 Whispering Pond is a 1BR romantic cabin getaway in the Tennessee Smoky Mountains. Embark to this Wears Valley one bedroom cabin rental with fireplace, hot tub, jacuzzi and more for your romantic Smoky Mountains honeymoon or cabin vacation. Book online & save 15%! Looking for a Dollywood cabin rental in Pigeon Forge for your honeymoon? Welcome to “A New Beginning,” a 1-bedroom cabin in Hidden Springs Resort that offers swimming pool access and more! Find your Smoky Mountain cabin in the woods, Sky Harbor Resort one bedroom cabin rental between Pigeon Forge and Gatlinburg with Internet Access and more. Choose an "Angel Haven" at our Pigeon Forge cabin rental with pool access in Mountain Park Resort, located just off the action-packed Pigeon Forge Parkway. Experience "Angels Ridge," a romantic 1 bedroom cabin in Pigeon Forge Arrowhead Resort with a swimming pool, hot tub, and a jacuzzi! Book & save online! Start your romantic Smoky Mountain getaway by booking this 1 bedroom cabin in Sevierville complete with a hot tub, fire pit, and a heart-shaped jacuzzi! Come experience "Bare Tubbin," a lovely 1 bedroom cabin near Pigeon Forge that comes with a hot tub, outdoor fire pit and a jacuzzi for your romantic getaway! Escape to "Bear Heaven," a charming Wears Valley cabin with loft! This cabin offers guests a wooded view, wood-burning fireplace, hot tub, and more! Come experience "Bear'ly Makin' It," a lovely 1 bedroom cabin in Wears Valley with a hot tub, views, a theater area, and a special 15% discount! Come experience "Cuddle Creek Cabin," a lovely 1 bedroom cabin rental with a hot tub, fire pit, and a creekside location only minutes away from Pigeon Forge! Let your vacation "Dreams Come True" at this pet-friendly cabin in Pigeon Forge, TN. You'll enjoy access to a year-round indoor pool, comfortable cabin features, and a convenient location at this dream cabin rental. Dreamweaver is a romantic honeymoon cabin near Pigeon Forge. Check out this Smoky Mountains cabin with heart-shaped jacuzzi for two and more. Online Discount! Take your sweetheart to a honeymoon cabin at Pigeon Forge's Cabins At The Crossing Resort. This one-bedroom cabin rental boasts swimming pool access, a hot tub and more! Looking for an anniversary cabin in Pigeon Forge, take a look at Huggable Hideaway between Pigeon Forge and Gatlinburg. Enjoy your vacation at this cabin in Arrowhead Ridge Resort in Pigeon Forge. "It's About Time" is a lovely 1-bedroom cabin in Pigeon Forge just a mile off the action-packed Parkway for a romantic retreat. Located in the beautiful Bluff Mountain Road area of the Smoky Mountains, "Kicked Back Creekside" is a lovely 1 bedroom cabin by a creek near Pigeon Forge! Pet friendly lodging Sevierville TN at Moose Lake Lodge, a 1 bedroom dog friendly cabin with hot tub, pool table, and more! Online Cabin Discount! Come stay at this Brookstone Village Cabin, which offers vacationers pool access, a hot tub, game room, and more! Come stay at this Pigeon Forge Honeymoon cabin with a hot tub, jacuzzi, and a 15% cabin discount! Book "Peek A View," a 1 bedroom honeymoon cabin that's only minutes away from Dollywood and Pigeon Forge with a view, pool table, hot tub, and a discount! Escape to Golf View Resort and enjoy a comfortable Pigeon Forge cabin rental, “Stairway To Heaven.” This cabin comes with both outdoor and indoor swimming pool access! Not a duplex cabin. Enjoy an affordable Smoky Mountains Honeymoon cabin near Pigeon Forge, "Starry Night"! Offering a comfortable cabin interior and a convenient location! Looking for a cabin with a great location between Gatlinburg and Pigeon Forge? Experience "Tennessee Dreamin" with a hot tub, game room, and a 15% discount! Escape to this 1-bedroom cabin near Dollywood and Pigeon Forge that offers a hot tub, a mountain view, a pool table, and a 15% discount on your rate! Come experience "Turtle Dovin'" a charming 1 bedroom cabin rental in the Wears Valley area near Pigeon Forge, TN with a fire pit and a hot tub! Paradise Ridge cabin Pigeon Forge near Tanger Outlet Mall and Dollywood. A Long Kiss Tonight is a 1 bedroom cabin close to attractions with Online Discount! Reserve “A Lover’s Retreat” today for an unforgettable. This Pigeon Forge 1-bedroom cabin rental offers guests a resort pool, hot tub, fireplace, Jacuzzi, wireless Internet access and more in Arrowhead Resort. Explore our cabin for rent near Dollywood in the Pigeon Forge area of the Tennessee Smoky Mountains. Cabin discount when booked online with Cabins USA! Smoky Hideaway, a 1BR cabin rental near the Smoky Mountains National Park great for honeymooners and families seeking an affordable Smokies vacation! Enjoy peace and quiet in the mountains at "Aah Rocky Top," an Echota Resort Cabin Rental near Pigeon Forge that sleeps 4. Stay at a comfortable 2-bedroom cabin rental near Pigeon Forge with fireplace, hot tub, WiFi, and more at "All by Grace!" "Angels Attic" is an affordable 1 bedroom cabin with a fireplace, jetted tub, and a hot tub with room for up to 4 guests near Dollywood in Pigeon Forge, TN! Escape to "Bear Hugs II" and enjoy a cabin with wooded view, fireplace, hot tub and more on an unforgettable cabin stay! Shop from your one bedroom Pigeon Forge cabin rental near Tanger Outlet Mall and Dollywood in the Tennessee Smoky Mountains. Online Discount! Enchanted Moments, an adorable Smoky Mountains honeymoon cabin in Pigeon Forge's Paradise Ridge area near Dollywood. Online Cabin Discount! A honeymoon cabin rental Pigeon Forge with heart shaped Jacuzzi facing and stone fireplace located between Pigeon Forge and Gatlinburg. Enjoy a fantastic romantic getaway in "Honeymoon Getaway," a 1-bedroom cabin in Pigeon Forge, TN! Book & save 15% on your rate with Cabins USA! Come experience "Jasmine's Retreat," a lovely 1 bedroom cabin that sleeps 6 in a beautiful forested location a short drive from Pigeon Forge, TN! Enjoy a Wears Valley honeymoon cabin complete with hot tub, wireless Internet, jacuzzi tub, and a 15% cabin discount! Book this affordable cabin in the Upper Middle Creek road area that offers quick access to Dollywood, Pigeon Forge, Gatlinburg, and the national park! Escape to beautiful Pigeon Forge, TN when you book "Merry Weather," a beautiful 1 bedroom cabin in the Lantern Hill community with a pool table & hot tub! Come experience "River Rush" a charming 1 bedroom honeymoon cabin in Pigeon Forge with river views, a fire pit, a hot tub, a heart-shaped jacuzzi, and a 15% discount! Check out Secret Rendezvous, one of our cheap cabins in Pigeon Forge for the budget minded Smoky Mountains vacationer. Even cheaper with Online Discount! Searching for cheap Pigeon Forge cabin rentals, check out Where The Magic Happens cabin near Dollywood and Pigeon Forge attractions. Enjoy this 1-bedroom cabin near Tanger Outlet Mall in the Pigeon Forge area on your shopping vacation or weekend retreat in the scenic Tennessee Smoky Mountains. This romantic 1-bedroom condo suite offers an indoor swimming pool, an outdoor swimming pool, an outdoor hot tub, and our 15% discount rate! "Hailey's Comet" is an affordable 1 bedroom Pigeon Forge condo for couples with an indoor & outdoor pool in Golf View Resort near Dollywood! Theater cabin rental located between Gatlinburg and Pigeon Forge in Sky Harbor Resort. Cabin Theater Room screen is 10 foot long with real theater seats! Find your theater cabin rental in the Pigeon Forge area at Sky Harbor Resort. This theater cabin rental is a 2 bedroom cabin with WiFi. Book & save 15%! Start an unforgettable Smoky Mountain vacation when you book "A Bear's View," a 2 bedroom cabin in Sky Harbor Resort with a game room & foosball! Book a lovely Wears Valley 2 bedroom cabin rental with pool table, hot tub, Internet access, Jacuzzi and more in the spectacular Tennessee Smoky Mountains. Welcome to Blackberry Ridge Resort where you can enjoy a premium Pigeon Forge cabin rental, “Absolute Delight!” on you vacation. Even better, this two bedroom cabin is eligible for an immediate cabin discount! Escape to a Pigeon Forge cabin with resort pool at "Almost Heaven!" This cabin at Arrowhead Resort offers guests a chance to enjoy a theater room, game room, and more! "Almost There" is a 2 bedroom luxury cabin rental in Bear Cove Falls in Pigeon Forge with a hot tub, pool access, a game room, and a 15% cabin discount! Take your sweetheart on a romantic retreat for 2 at this Wears Valley honeymoon cabin which features a fireplace, jacuzzi, hot tub, and more! Discover this Wears Valley cabin rental with theater room and experience your memorable vacation in the scenic Tennessee Smoky Mountains! Online Discount. Big Sky View vacation rental Tennessee Smoky Mountains. A 2 bedroom vacation rental home with hot tub, fireplace, game room and more in Sky Harbor Resort. Stay at a cabin you "Can't Bear To Leave," a luxury Sky Harbor rental with two bedrooms, a theater room, hot tub, arcade games, in a Smoky Mountain forest! Reserve your romantic creekside cabin in the beautiful Smoky Mountain Ridge Resort area! This luxury, 2-bedroom cabin is only 5 miles from Pigeon Forge! Experience luxury only minutes away from Dollywood at "Eagle's Crest," a beautiful 2-bedroom resort cabin with mountain views, a theater room, and a hot tub! See for miles and miles in Pigeon Forge, TN when you stay at "Fifty Mile View," a luxury 2-bedroom log cabin rental only 4 miles from Dollywood Theme Park! Book "Flying Bear" today with Cabins USA and save 15% on your Bear Cove Falls Resort cabin rental in Pigeon Forge near Dollywood Theme Park! Lucky Break is a Starr Crest Resort Pigeon Forge cabin rental near Dollywood with resort swimming pool access, WiFi, pool table and more. "One More Night" is a luxury cabin in Pigeon Forge close to Dollywood with a mountain view, air hockey, game room, and room for 6 guests! Book & save 15%! "Pool N Around" is a luxurious 2 bedroom cabin near Dollywood that boasts a private indoor pool, a theater room, a game room, and a 15% cabin discount! Pet friendly lodging Pigeon Forge Tennessee near Dollywood Amusement Park and less than a mile off the action packed Pigeon Forge Parkway. Online Discount! Book a relaxing stay at “Rushing Waters,” a 2-bedroom cabin by the River in Pigeon Forge that puts you right next to the fun and excitement of the Parkway. Come experience this beautiful luxury cabin with a view n the Smokies that comes complete with a private indoor pool, a game room, theater room, and a stunning setting! This Pin Oak Resort Pigeon Forge cabin is within walking distance of big Pigeon Forge attractions like Wonderworks, Titanic, and The Hatfield McCoy Dinner Show. Two bedroom Bear Cove Falls Pigeon Forge cabin rental less than a mile off the Pigeon Forge Parkway with outdoor swimming pool access. Discover southern comfort at this cabin near Pigeon Forge and Dollywood on your family vacation to the Tennessee Smoky Mountains. Online Cabin Discount! “Southern Style” offers guests a 5 Star cabin near Pigeon Forge with an elegant interior that accommodates up to 7 guests. Immediate Online Cabin Rental Discount! "Splash Mountain Lodge" in Pigeon Forge, TN is a log cabin complete with a private indoor pool, a game room, and an impressive mountain view in the Smokies! Come experience the best the Smokies can offer at this luxurious 2 bedroom cabin near Dollywood that boasts a year-round pool and a game room! Luxury Cabin In Pigeon Forge, TN with an indoor pool, mountain view, and prime location near Dollywood. Reserve "The Waterlog" online today and save big! Stay in a log cabin with mountain views, a theater room, game room, and all the comforts of home. Book your rental online to save 15% with a cabin discount! Stay at "A Beary Happy Place" cabin by Cabins USA in Pigeon Forge, TN! Enjoy a great location near Dollywood at this 2 bedroom cabin that sleeps up to 8 in comfort! Honeymoon cabin in Sky Harbor Resort. A Beary Special Place is a 2 bedroom honeymoon cabin located between Pigeon Forge and Gatlinburg with Internet access. Welcome to "A Cozy Cabin!" This 2 bedroom, Pigeon Forge cabin rental comes complete with pool access, a hot tub, and more for an affordable nightly rate! Enjoy this comfortable 2-bedroom vacation home in Pigeon Forge, TN with a hot tub, jacuzzi, and lovely mountain view. Book today & save 15% on your rental! Welcome to "A Hummingbird Hideaway," a beautiful 2-bedroom cabin located off of Bluff Mountain Rd. in Wears Valley, TN only minutes away from Pigeon Forge! Book a luxury cabin in Pigeon Forge, TN with two bedrooms, a hot tub, mountain views, pool table, jacuzzi tub, and a great location in Lantern Hill Resort! A Peaceful Retreat, a charmingly beautiful 2 bedroom cabin in the Smoky Mountains Sky Harbor Resort. Enjoyable Smoky Mountain Ridge Resort cabin in Wears Valley with swimming pool access close to action packed Pigeon Forge. Online Cabin Discount! Welcome to Blackberry Ridge Resort's "All Tucked Inn" cabin, an inviting 2 bedroom cabin in Pigeon Forge with swimming pool access. Choose this Wears Valley cabin rental sleeping up to 6 guests with 2 bedrooms, WiFi Internet, hot tub and more. Book online for an immediate discount! Enjoy a comfortable cabin getaway and a convenient location at "Amazing Grace II," a 2-bedroom vacation rental near the Parkway that offers guests a hot tub, jacuzzi tub, gas fireplace and more! Check out this lovely cabin for rent in Pigeon Forge! "Autumn Ridge" is a luxurious two bedroom with resort swimming pool access, WiFi Internet, and more! Welcome to Bar None, your Pigeon Forge 4 Star cabin in the Smokies. A beautiful Smoky Mountain 2 bedroom cabin rental between Pigeon Forge and Gatlinburg. Private Gatlinburg cabin rental with game room and Internet access. Located in Sky Harbor Resort just off the Gatlinburg – Pigeon Forge spur. Enjoy a hot tub, game room, and pool table in "Bear Necessity," a 2-bedroom cabin on Wears Valley Road only 3 miles from Downtown Pigeon Forge! Pigeon Forge - Gatlinburg 2 Bedroom cabin rental off the spur with easy access to endless Smoky Mountains vacation fun for the entire family. Come stay at this Wears Valley Cabin that sleeps 4 and enjoy an unforgettable cabin vacation with your cabin that offers a jacuzzi, hot tub, and a special discount! Enjoy this semi secluded Pigeon Forge cabin near Dollywood with sauna, hot tub, WiFi Internet and more. Online Cabin Discount! Experience "Catch of the Day" in Sherwood Forest Resort in beautiful Pigeon Forge, TN! This 2-bedroom cabin sleeps 6 guests in comfort with great amenities! Looking for a log cabin by a creek that's also near Dollywood Theme Park? Experience "Cherokee Creekside," a two-bedroom log cabin in the Smoky Mountains! Endless Joy, a Smoky Mountain rental cabin nestled in Sky Harbor Resort between Pigeon Forge and Gatlinburg. Book Online for immediate Cabin Discount! Browse Pigeon Forge cabin rentals in Brookstone Village Resort. Foxes Den, a 2BR cabin with pool access and just off the action packed Pigeon Forge Parkway! Honeymoon cabin in Pigeon Forge with air hockey, hot tub and fireplace sleeping up to 7 guests. Online Cabin Discount and year round cabin Specials! Experience a great cabin vacation only a mile from Downtown Pigeon Forge in "Growly Bear," a 2 bedroom cabin with a hot tub, resort pool, and a 15% discount! This cabin with pool table, Internet access, hot tub and more in Sky Harbor Resort places guests between Pigeon Forge and Gatlinburg. Enjoy this affordable cabin on your next Smoky Mountains vacation! Welcome to our cabin resort near Pigeon Forge were you'll enjoy Lil Country Cabin, a 2BR cabin rental near Dollywood with swimming pool access, hot tub and more! Book this Pigeon Forge family cabin and take your family on an unforgettable cabin vacation. Features king bedrooms, hot tub, wireless Internet, and more! This secluded 2-bedroom cabin in Sevierville, TN places guests in a quiet wooded setting that’s close to all the fun and attractions of nearby Pigeon Forge. Enjoy a stay at "Mountain Moonlight," a comfortable 2-bedroom cabin rental in Wears Valley that boasts a great spot near Pigeon Forge and a 15% discount! Enjoy a 2 bedroom log cabin with room for 8 guests that comes with a hot tub, jacuzzi tub, fireplace, and more for an unforgettable, affordable Smoky Mountain vacation! "Radiant Ridge" is a beautiful Black Bear Ridge Resort cabin rental that's complete with 2 bedrooms, a hot tub and resort pool access off of Wears Valley Rd. Welcome to "Rippling Waters," an affordable 2-bedroom vacation rental located near the Little Pigeon River in Pigeon Forge that's only a mile from downtown! Escape to peace, tranquility, and "Serenity" at this 2-bedroom cabin in Country Oaks Resort that offers a comfortable interior and a great location! Embark on an adventure to a Pigeon Forge cabin with wood burning fireplace, jacuzzi tub, and more at "A Bear Adventure!" Experience this affordable cabin in Pigeon Forge with a beautiful creekside location, a fire pit, a hot tub, and a game room with a pool table & air hockey! Welcome to A Hilltop Heaven, your Pigeon Forge 2 bedroom cabin rental with scenic mountain views, WiFi Internet, hot tub, game room and more. Stay at an affordable Pigeon Forge 2 bedroom cabin with hot tub, wireless Internet access, fireplace and more on Upper Middle Creek close to Dollywood! Escape to your comfortable cabin near Pigeon Forge that sleeps 7 with a foosball table, pool table, hot tub and more at "A Wolf's Den!" Looking for an affordable cabin that's close to Dollywood with a mountain view? Check out "Bears and Beyond" a 2 bedroom cabin with a special discount! Located in River Pointe Resort, you'll find this affordable 2 bedroom vacation home that boasts a prime spot less than 1 mile from the Pigeon Forge Parkway! Enjoy a getaway for every member of the family at "Hillbilly Deluxe", a pet-friendly 2-Bedroom cabin in Pigeon Forge. Experience "Honey Bear Hill" for your affordable cabin getaway in Pigeon Forge, TN! This two-bedroom log cabin is perfect for couples! Come experience "Making More Memories," an affordable 2 bedroom cabin in Sevierville that sleeps 8 guests comfort and boasts a hot tub, pool table, and beautiful setting. Escape to "Mountain Music", a 2-bedroom vacation home with jacuzzi, deck, and other comfortable cabin amenities! Book this affordable 2 bedroom cabin with swimming pool access and a prime location off Wears Valley Road less than 2 miles from the Pigeon Forge Parkway! Come escape to the mountains at "Tin Pan Alley," 2-bedroom cabin in Pigeon Forge with theater room and more in Eagles Ridge Resort. Welcome to The Bunkhouse, a Pigeon Forge cottage rental with swimming pool access only a mile off the action packed Pigeon Forge Parkway. Online Discount! Looking for an affordable condo that's right off the Pigeon Forge Parkway? This vacation condo boasts a prime location and an indoor & outdoor pool! "Vista View" is a beautiful, spacious, 2 bedroom condo in Golf Vista Condos near Dollywood in Pigeon Forge, TN! Book this condo today & save 15%! This 2 bedroom Pigeon Forge condo suite is located within walking distance of the Pigeon Forge Parkway and it comes complete with an indoor & outdoor pool! Welcome to "4 Paws," a 3 bedroom cabin in Wears Valley with room for 6 guests. Book this cabin with a fire pit, game room, hot tub, and scenic views! Come experience "A River Retreat," a beautiful luxury cabin with a river view, a private outdoor pool, and a prime location in Downtown Pigeon Forge, TN! Book your premium 3 bedroom cabin in Pigeon Forge with awesome Smoky Mountain views, hot tub and more with Cabins USA for your immediate Cabin Discount! Looking for a cabin near Pigeon Forge & Gatlinburg? This luxury cabin boasts a prime location and comes with a hot tub, game room, and a 15% discount! Experience "Bearfoot Dreams," a beautiful log cabin with 3 bedrooms in a forested spot just off of Wears Valley Rd. Book today with Cabins USA and save 15%! Located in the exclusive Legacy Mountain Resort area, "Blue Sky" is a gorgeous 3 bedroom cabin with pool access, a hot tub, and a stunning mountain view! Your spacious 3 bedroom Pigeon Forge cabin rental with fireplace, hot tub, jacuzzi, and more is located just off the action packed Pigeon Forge Parkway only minutes from Dollywood. Honey Bear is one of our Wears Valley cabin rentals, near Pigeon Forge, with mountain views accommodating up to 9 guests. Online Cabin Discount! 3 Bear Cove Falls Resort cabin rental near Dollywood is less than a mile off the Pigeon Forge Parkway and comes with with swimming pool access. Looking for a Smoky Mountain cabin with a view? Look now further than "River Breeze" a 3 bedroom cabin near Pigeon Forge with hot tub, jacuzzi tub, wireless Internet, and more! Looking for a comfortable Smoky Mountain cabin for your family? Reserve "Star Gazer," a beautiful 3-bedroom, rounded cabin with a mountain view, and pool access! Welcome to Starr Crest Resort Pigeon Forge cabin Sugar and Spice, a luxury 3 bedroom cabin with resort swimming pool access next to Dollywood. "Sugar Bear View" is a lovely 3 bedroom cabin located between Wears Valley and Pigeon Forge with a beautiful mountain view in the Smokies! Bear Cove Resort Pigeon Forge TN cabin rental with outdoors swimming pool access and less than a mile off the action packed Pigeon Forge Parkway. Stay only a few minutes from Pigeon Forge and Dollywood in a beautiful 3-bedroom cabin with a mountain view, game room, hot tub, and a special discount! Escape on a Pigeon Forge vacation at a 3-bedroom cabin near The Island at "Almost Paradise!" Enjoy exciting amenities such as a theater room and a game room with a multi-cade arcade with 60 games in one! Located in the beautiful Covered Bridge Resort area of the Smokies, "Bear Mountain Lodge" is an unforgettable 3 bedroom cabin with a view in the Smoky Mountains! Come experience "Bella Casa" in Pigeon Forge rests in the beautiful Wears Valley area. Enjoy this cabin complete with an air hockey table, hot tub, and more! The perfect Smoky Mountains cabin rental for your family cabin vacation in Tennessee. Bluebaery Hill, a 3 bedroom cabin between Pigeon Forge and Gatlinburg. Plan a Pigeon Forge vacation in a 3-bedroom cabin with a hot tub, game room, and more in the beautiful Sky Harbor Resort area in the Smokies! Experience Fort Knoxx in beautiful Sky Harbor resort area in a semi-secluded location. Book today with Cabins USA & save 15% on your lodging! Take your family to this downtown Pigeon Forge Cabin that offers guests a hot tub, jacuzzi, gas fireplace, and more! Book this 3 bedroom cabin near Dollywood and enjoy tons of cabin features such as a game room, fireplace, and hot tub! Located less than 4 miles from Pigeon Forge, "Memory Maker" is an excellent 3 bedroom cabin with mountain views, a game room, hot tub, and a discount! Cedar Creek Crossing Resort invites you to "Smokies View", your premium 3 bedroom Smokies cabin rental with pool table game room, WiFi, fire pit, and more. Enjoy a fantastic escape to the mountains at "Up to Nut'n," a 3-bedroom cabin near Pigeon Forge that offers guests pool access, a game room, convenient location, and more! "Wolves Den" is a beautiful 3-bedroom cabin rental in the Mountain Park resort area that's only a mile from the heart of Pigeon Forge. Save with a discount! Book your 3 bedroom cabin in Pigeon Forge with Internet access, hot tub and more with an immediate Online Cabin Discount! Come experience "Cheeky Chipmunk Getaway" a 3 bedroom cabin in Hidden Springs Resort in Pigeon Forge with a hot tub, pool table, and pool access! "Family Getaway" offers guests a Smoky Mountain vacation rental in Pigeon Forge's Mountain Park Resort that sleeps up to 10 guests and provides swimming pool access, a great location, and WiFi Internet. This affordable 3 bedroom condo rental in Pigeon Forge has an indoor pool, an outdoor pool, a jacuzzi, electric fireplace, and more right off the Parkway! Escape to your dream vacation getaway at “My Pigeon Forge Retreat.” This condo for rent in Pigeon Forge offers resort amenities, a comfortable interior, and a convenient location. Book this luxurious 4 bedroom vacation home in the Walden's Creek area of the Smokies to enjoy a stunning mountain view, hot tub, and a 15% discount! Escape to "A Peaceful Easy Feeling" at this Dollywood cabin in Hidden Springs Resort that rests less than five minutes from Dollywood and Dollywood's Splash Country Water Park. Enjoy “Bear-E-Nice”, a gorgeous Pigeon Forge Brookstone Village cabin with pool access just off the action-packed Pigeon Forge Parkway! You can enjoy a great location and a comfortable interior at this cabin retreat. Check out this luxury cabin in Pigeon Forge that comes with 4 bedrooms and access to an indoor and outdoor swimming pool! Come to Pigeon Forge to experience "Dreamland." This exceptional 4 bedroom cabin has resort pool access, a game room, and Cabins USA's 15% discount! This Hidden Springs Resort cabin rental near Dollywood offers guests year round heated indoor swimming pool access, sleeps up to 12 guests, and gives guests great cabin features. "Hideaway Dreams" is a beautiful, luxury 4 bedroom cabin in Wears Valley with mountain views, a hot tub, game room, theater room, and a 15% discount! Escape to a four-bedroom Pigeon Forge resort cabin near Dollywood in Hidden Springs Resort with indoor and outdoor swimming pools. Immediate Online Cabin Discount! Experience "Lodge Mahal" only a few minutes away from Pigeon Forge, TN. This 4-bedroom premium log cabin boasts a game room, hot tub, and incredible views. Experience "Majestic View," a luxury cabin in Pigeon Forge with impressive mountain views, a hot tub, game room, and resort pool access! Your Dollywood cabin Pigeon Forge TN called Shakonohey is located in Hidden Springs Resort with year round indoor swimming pool access and WiFi Internet. Enjoy a Pigeon Forge vacation only 1 mile from the Parkway when you book this 4 bedroom cabin rental with pool access, a game room, and a hot tub! Enjoy the mountain air at this 4-bedroom cabin with a 3-level deck, resort pool access, and more for an unforgettable Smoky Mountain vacation! Discover cabin resort rentals in Pigeon Forge TN. Mountain Park Resort's Bear Play cabin is just off the Pigeon Forge Parkway with swimming pool access! Check out this Pigeon Forge rental cabin with hot tub that places vacationers less than a mile off the action packed Pigeon Forge Parkway! Get your immediate 15% Online Cabin Discount! Take your family to this 4 bedroom Pigeon Forge cabin with pool access, jacuzzi tub, hot tub, and more! Stay at thus Pigeon Forge 4 bedroom cabin 1 mile off the action packed Pigeon Forge Parkway in Mountain Park Resort with resort swimming pool access, hot tub, and more! Suite Retreat is your cabin rental near the Great Smoky Mountain National Park. An affordable 4 bedroom cabin rental with mountain views and much more! Come experience "Sweet Mountain," a beautiful 4 bedroom cabin that sleeps 13 guests just one mile from the action-packed Pigeon Forge Parkway! Come enjoy a “A Smoky Mountain Experience” at this 4 bedroom cabin near Dollywood with swimming pool access in Cabins At The Crossing Resort. Need an affordable 4 bedroom cabin that's close to Downtown Pigeon Forge? Come see "Mountain Crest," a beautiful cabin in Eagles Ridge resort in the Smokies! Want to stay only minutes away from Downtown Pigeon Forge? "Mountain Destiny" is a 4 bedroom cabin that places you only a mile from all the action! Come experience "Mountain Fever," an affordable 4 bedroom log cabin rental in Pigeon Forge with a pool, hot tub, and pool table in Eagles Ridge Resort! Welcome to our Mountain Park Resort cabin “A Perfect Stay!” This 5 bedroom Pigeon Forge cabin rental greets guests with swimming pool access, a home theater, and more! Cabins downtown Pigeon Forge Tennessee with swimming pool access in Arrowhead Resort. All Together Now cabin sleeps 16. Book online Cabin Special! Experience "Big Mack Lodge," a luxury 5 bedroom cabin near Downtown Pigeon Forge & Dollywood that comes with pool access, a hot tub, and a theater room. Escape to a luxurious lodging when you stay at “Cloud Bound!” This 6-bedroom luxury cabin in Pigeon Forge offers guests a private indoor pool, a game room, a theater room, and more! Experience true luxury on your Pigeon Forge vacation when you book, "Dive Inn," a 5-bedroom cabin with a private indoor pool and a special 15% discount! Looking for a luxury cabin in Pigeon Forge? "Elk Ridge Lodge" is a 5 bedroom log cabin with a private pool, mountain views, a hot tub, game room, and more! Experience "Endless Sunsets," a luxury cabin in Pigeon Forge with 5 bedrooms, an indoor pool, resort pool hot tub, theater room, and a mountain view! Escape to your own Tennessee vacation cabin at "Hilltop Hideaway", a five-bedroom cabin in Sevierville that sleeps up to 15 guests and offers swimming pool access and wireless Internet. Looking for a luxury cabin in that's close to the best attractions in Pigeon Forge? This 5 bedroom cabin might just be perfect for your vacation! Looking for a spectacular Pigeon Forge cabin for your getaway? "Makin' Waves" boasts beautiful mountain views, an indoor pool, game room, hot tub, and more! Enjoy this 5-Bedroom vacation rental near Pigeon Forge with pool access in Cabins At The Crossing Resort that offers everything you need for an unforgettable group vacation. Come stay at "Soaring Ridge Lodge," a superb 5-bedroom cabin in Wears Valley with elevator, game room, theater room, and more! Experience "TrinQuility View," a gorgeous 5 bedroom luxury Pigeon Forge cabin that comes with a private pool, theater room, game room, and a 15% discount! Select this 5 bedroom cabin rental Pigeon Forge with resort swimming pool access, wireless Internet and more in Mountain Park Resort. Enjoy a luxurious cabin stay at "A Stunning View", a 5-bedroom cabin with pool access, hot tub, 2-story deck, and more! Come explore this exciting 5 bedroom Pigeon Forge cabin rental under a mile off the action packed Pigeon Forge Parkway with pool access and Cabin Discount! Enjoy a comfortable cabin close to all the action at "Cowboy Up!" This Pigeon Forge cabin with pool access offers the perfect spot to enjoy a Smoky Mountain vacation. Come experience this 5 bedroom cabin in Pigeon Forge with a game room and pool access in Hidden Springs Resort in the Smoky Mountains! "A Smoky Mountain Dream,” a luxury group cabin in scenic Wears Valley’s Smoky Mountain Ridge Resort, offers an indoor pool, game room, theater room and more! Nestled in Alpine Mountain Village, this luxury group cabin in Pigeon Forge comes with 6 bedrooms, a game room, a hot tub, and more! Enjoy "Amazing Grace" a cabin with an indoor pool, a mountain view, game room, and a 15% discount close to Pigeon Forge in the Great Smoky Mountains of Tennessee! Book "Bear Cove Lodge," an excellent 6 bedroom cabin that sleeps 18 guests with a great location near Downtown Pigeon Forge and Dollywood! This luxurious mountain lodge in Wears Valley features stunning mountain views, 6 bedrooms, a game room, and it comes with a 15% cabin discount from Cabins USA! Have an experience like none other at this luxury resort cabin in Pigeon Forge, TN with a theater room, game room, hot tub, and an outdoor swimming pool! Searching for a large cabin close to Dollywood with pool access? Look no further than "Copper Ridge Lodge" in Starr Crest Resort by Cabins USA! Check out "Crosswinds" a beautiful 6 bedroom cabin in Pigeon Forge that sleeps 18 guests. Book this cabin 1 mile from the Pigeon Forge Parkway & save 15%! Welcome to "High Dive," a luxurious 6 bedroom cabin that boats a private indoor pool with a waterfall and a special 15% discount rate! Book "Majestic Mountain Splash" located in Smoky Mountain Ridge Resort in Pigeon Forge with an indoor pool, game room, theater room, and 6 bedrooms! Book "Majestic Splash" for an unforgettable cabin vacation with an indoor pool, game room, a theater room, and a special 15% discount rate! Come experience a Smokies log cabin with a private indoor swimming pool, a beautiful mountain view, theater room, game room, and more! Come enjoy "Swimmin' in the Smokies," a luxury 6 bedroom log cabin with a hot tub, and a private indoor pool that sleeps 12 guests! There is nothing more luxurious than a Pigeon Forge cabin rental with indoor pool! Stay in this 6-bedroom Pigeon Forge cabin rental for a Pigeon Forge cabin vacation to remember! Take your family to this 6 bedroom cabin in Pigeon Forge with hot tub, fireplace, game room, and more! Come experience "Poolside Lodge," an impressive 7 bedroom cabin in Pigeon Forge that sleeps 19 and offers pool access, a fire pit, a theater room, and more! Welcome to our home theater lodge in Pigeon Forge, "Rocky Top Lodge," a 7-bedroom lodge with state of the art theater room, baby grand piano, and much more! Pigeon Forge 7 bedroom cabin rental with swimming pool access, hot tub, pool table, stand up arcade and lots more in Cabins At The Crossing Resort. Come stay at this big Pigeon Forge cabin with hot tub, jacuzzi tub, fireplace, and more on your Smoky Mountain vacation for your family reunion, church retreat, or other group gathering. Looking for a group cabin that's close to Downtown Pigeon Forge? Look no further than "Smoky Mountain Lodge," a 7 bedroom cabin rental that sleeps 17 in comfort. Book a cabin for a reunion, church retreat, or group vacation with Family Gathering, a Pigeon Forge cabin that sleeps 28 guests with swimming pool access, WiFi, and more!e. Hidden Springs Resort cabin rental, Great Aspirations. A Dollywood cabin rental sleeping up to 20 guests with endless views and swimming pool access. Bring your group to experience luxury in the Smokies at "Marco Polo," a beautiful 8 bedroom cabin rental in Black Bear Ridge Resort with an indoor swimming pool! Looking for an 8 bedroom cabin rental that sleeps 25 guests in Pigeon Forge, TN? Check out this luxurious new cabin with an indoor pool, game room, and more! Book your very own luxury group cabin in Pigeon Forge, TN complete with a theater room, hot tub, game room, and plenty of comfortable space for 24 guests! Experience a luxury large cabin in Pigeon Forge with 8 bedrooms and room for 28 guests! Stay in the Smokies in style with an indoor pool and theater room. Previously known as "Views Daze Lodge," this luxurious 12 bedroom cabin sleeps 54 guests and boats a mountain view, indoor pool, and a theater room! "Smoky Mountain Memories" is an incredible 12 bedroom cabin with an indoor pool and outdoor pool access in beautiful Pigeon Forge, TN! "Big Vista Lodge" is an expansive 16 bedroom cabin rental that sleeps up to 64 guests in comfort. Book this cabin for large groups and save 15%!